Added PHP 7.3 to all servers, you can move. Added the ability to transfer domains to another account. The receiving party will receive a notification and must accept the domain in its account. Finally added work with wildcard certificates! Details in community on russian. Updated MySQL to version 5.7 and added the ability to work on PHP 7.1 and PHP 7.2-rc. Added MODX 2.6.0-pl for installation. Added the ability to replenish the account with promotional codes. Updated PhpMyAdmin to the latest version 4.7.3, increased some limits for its work and forced to open strictly through https. We launched a domain management in a separate section of the service. Installed on the service file manager SPRUT.io. Now you can work with files right in your browser! Implemented the service "promised payment". Now you can enable your site for 3 days, if your balance is not negative. Added the output of recently deleted sites. Now you can try to restore them yourself if there are still backups on the server. Added the ability to authorize under multiple accounts. Now one user can quickly manage the sites of different accounts, quickly switching between them. Great site update. All scripts and styles has been rewritten, many improvements of ergonomics. Details in our community. Added the ability to change system directories for MODX Revolution. Due to the discovery of new vulnerability in MODX sites, table prefixes when creating new and reinstall the old sites are automatically generated. For existing sites, you can change the prefix at the information panel (under the MySQL password). Launched a new server h7.modhost.pro at the data center of Selectel in Moscow. Added new tariffs for large sites: "Maximum x2" (32 Gb SSD) and the "Maximum x4" (64 Gb SSD). We added the integration with Let's Encrypt service! Now you can get free certificates for all your domains. Updated Nginx to version 1.10.1 and enabled http/2 for all https sites by default. View the latest records from the logs of the website right in the control panel. We have updated PHP to version 5.6 and added more productive PHP 7.0. You can switch between them at any time. We are launched a new server h6.modhost.pro in the Republic of Belarus. Updated notification system. Now are counted all of the sites, which period of work ends in a 10 days. Notifications will be sent every day until the account is not renewed, or run out of operating sites. In the protected environment of sites was added ps, top and htop utilities. Now you can monitor your resources consumption in real time. Added a limit on the number of simultaneous running test sites per user - 3 pieces. Added ability to choose server location when creating a website or changing plan. Now available the new server h5.modhost.pro, in Germany at the Hetzner. The new control panel is enabled by default. All parts of the service translated into English. A new control panel launched in test mode. Details in our community. In the protected environment of sites was added the utility screen. Separate accounting for the size of the database in the monitoring system of the site. Fixed accounting of database size in the overall limit of storage. Now you can download a backup even from disabled site. Added system for monitoring the operation of sites. Details in our community. New article in «Help» section «Non-cash payment for legal persons» — describes the process of invoice payment and document management. Updated support section. Now you can ask not only technical questions and close tickets by yourself. Updated design of control panel. Ability to enable yearly billing with discount 10%. Добавлены новые тарифы и сервер в России. Подробнее в анонсе на modx.pro. A new article is added to "Help" – "Website control panel" – describes all basic facilities of Modhost control panel. The facility to forward TCP ports in the secure environment is on. Now it is possible to connect to MySQL through SSH remotely. An article is added to "Help"- "Quick start". The recommended update button is marked in orange. Not the current but the last stable version is selected at once updating CMS website. 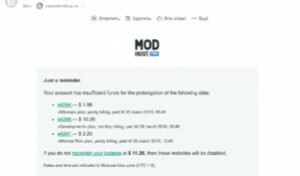 MODX 2.3.3-pl and MODX 2.2.15-pl are off. Now any subdomain can be added to the service domain. The layout error, when it was impossible to top up the balance from a mobile phone (necessary elements were not shown), was fixed. When you restore a website from a backup copy, its passwords in the control panel are also restored. To install and update the access to a new version of MODX Revolution – 2.3.5-pl. To install and update the access to a new version of MODX Revolution – 2.3.4-pl. A floating website can be placed under control of another account. The account for the number of domains on the tariff is modified. Now they are counted as first-level domains and subdomains can be added without limits . The virtual console is added to the secure environment. Now Ctrl+O functions well in Midnight Commander. The article about cron manipulation is added. The article about https settings is added. The article about manual backup copying is added. The facility to generate a copy for the site. Referral program for hosting users is invoked. The facility to create a website without installing the CMS. The facility to transfer a website to another account. The new tariff for designer at a reduced price and an absence of operating domains. Composer, Grunt, Gulp and others are installed. Now you can indicate a separate email to send copies of website condition and balance notification in your profile. The notification about the impossibility of automatic website extention is improved. Now you will get notifications from 10, 5, 3, 2 and 1 day before website tripping if there are not enough recourses on your account. The search in website tables seeks in attached domains as well. ImageMagick is fixed in the secure environment of the website. A new version MODX Revolution 2.3.3-pl is available on the hosting. The Internal work on PHP launch in secure environment is held. If you experience any problems with your script execution, call the technical support. New websites receive service addresses of domain modhost.pro. 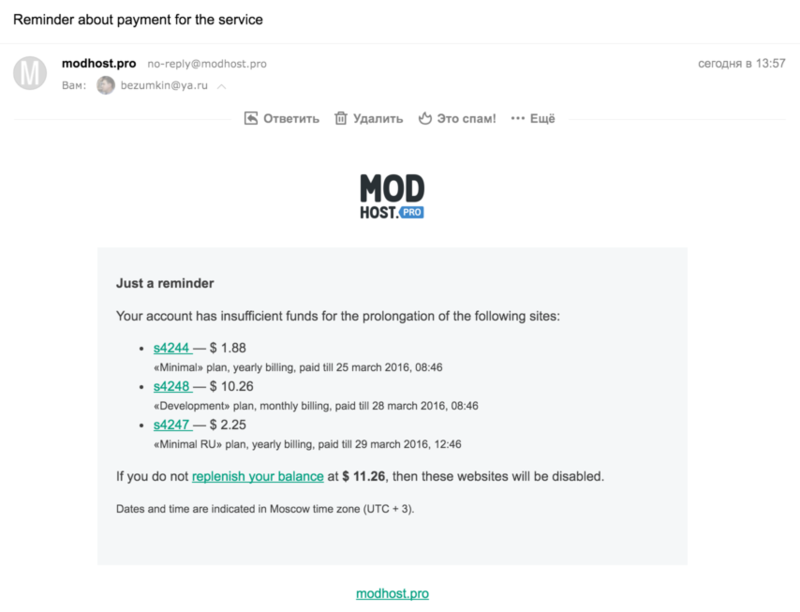 New service domain – modhost.pro. The details are in our community. New tariff line. The details are in our community. The facility to launch php from server console for new websites is added. Scripts function in secure environment that is why some functions may not be supported. HDD size on testing tariff is expanded to 250 Mb. Free packets are not deleted after automatic installation when creating a website. Paid packets are replaced by the files with zero size to avoid errors in MODX log. Information window about the website is completely remade. Now you can change SSH/SFTP, MySQL passwords and admin MODX Revolution by yourself. The retention cycle for a backup copy is extended to 20 days after website deletion. In all you can launch your website during 1 month after deletion in case of nonpayment. The facility to restore deleted websites is added – call the technical support. Of course, it should be done not later than 2 weeks after deletion, when you still have backups. Testing websites are not deleted right after the end of their work – they can be transferred to paid tariff during 24 hours. A small improvement of website control panel. The design of notification letters is changed. Notifications about new versions are input separately for different branches of MODX Revolution: 2.2 and 2.3. A new version of MODX Revolution 2.2.16-pl was added. Add-in installation when creating and reinstallation of websites is added. On the testing tariff paid add-ins are available from Simple Dream repository. The details are in our community. A search line is added to the control panel. You can seek by website, system or tariff name. Unused tariffs "Trademark-2" and "Advanced" are cut off. Tariff "Advanced-2" is renamed to "Advanced". Service slider and add-ins are updated to the last version. The page to control Email is added. The page to control DNS is added. From today, the service functions only though secure connection https. The facility to reinstall a website completely and to delete all the data is added. The support of Cyrillic domains is added in xn--***.xn--p1ai. A bug when configuring nginx is fixed, the block location had contained nested location. Page Help is added, with nginx configuration examples. The notification distribution about tripping of a website 24 hours beforehand is added, only if there is no money on account to auto-extention. When adding any domain to a website www.domain is registered for free. The design of payment letters was improved. error.log – log of nginx errors, there areп all 404 not found and php errors php (if input is on). slow.log – log of slow php queries, which are loaded longer than 5 seconds. Logs are changed every 24 hours and are kept for 7 days. Timeout for operations is added. Now if it takes longer than 10 seconds for a backup to load, you get a message that the work continues on the background mode. The new facility to change a tariff once a 24 hour is added. The settings of free tariff "Testing" are changed. Memory_limit was reduced from 128 Mb to 32 Mb, sending emails through sendmail is cut off. The controlling service on a server is not blocked at simultaneous enquiries. That is you can made a backup copy on one site and edit rules Nginx on another. Quota design on HDD is improved: from 1024 Mb it shows 1Gb. The page with tariff descriptions is added.